What can I really say that will convey how I felt about this book? King once again proves that he is THE master storyteller and leaves you itching for more. 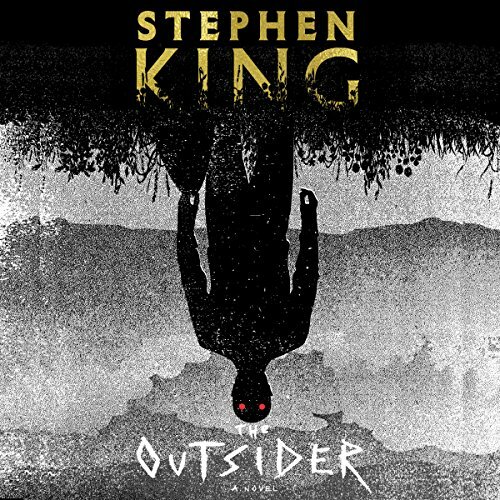 The Outsider is proof that King isn’t going anywhere, anytime soon and will be haunting us for years to come. I feel like this novel combines the best parts of the Bill Hodges Trilogy, It, and Revival, only to create something original and beyond what any of us expected. An eleven year old boy is found dead and mutilated in a park near the center of town, grotesquely assaulted and missing pieces of flesh. All evidence, including fingerprints and DNA, without a shadow of a doubt match a local beloved youth baseball coach by the name of Terri Maitland. Detective Ralph Anderson and his partner Bill Samuels arrest Maitland publicly during the state championship game and take him in for questioning. Though Maitland has a foolproof alibi with video evidence to back it up, the evidence and eye witness testimonies continue to prove that Maitland committed the crime. But how can someone be in two places at once? Going any further into the synopsis would absolutely ruin this book for you. The twists you never see coming happen around 50ish% and keep you guessing the rest of the way through. The character development, especially that of Terri Maitland, fully encaptures the struggle of being a town hero who is falsely blamed for a crime, and the effect it has on his family, friends, and the locals; people, no matter how loyal or friendly, unwilling to deal with the revelation of innocence. For King, who has been writing for so many years, to continue to ramp up the suspense and keep us readers engaged, hooked on every word and chapter, is something truly exceptional and I for one will continue to pre-order everything he publishes. I also have to note that Will Patton, once again, does an exceptional job narrating a King novel. Patton narrated the Bill Hodges Trilogy, which is one of my all time favorite series, and instantly became one of my top narrator choices. King also brought Holly Gibney (Bill Hodges Trilogy) back into the fold in The Outsider. She is one that Patton nailed down so well and will continue to live on as one of my all-time favorite characters. The Outsider is a deeply unsettling novel that will find itself crawling under your fingernails. It is one that will leave you feeling absolutely nothing by the end because you have exhausted all emotion throughout its entirety. It is a must-read and will go down as one of my Top 5 books this year, guaranteed. Solid review. I dont think I’ve seen a bad review of this book yet! Thank you, Lilyn! This will probably be a re-listen at some point this summer. It is THAT good. Thats awesome! You know when you mark a book for a reread so soon that its doing something right! I haven’t been able to read Sleeping Beauties or Gwendy’s Button Box, but I haven’t heard a TON of great things about either. But I will stress that this one needs attention! I definitely implore you to do so! Oh man, I haven’t picked up a King book in years! Probably not since 11/22/63. A lot of the books he’s written since have been from series I haven’t started or collabs that I just wasn’t as interested in though, but now THIS is one I gotta check out! Absolutely. If you end up enjoying this one, I suggest picking up the Bill Hodges Trilogy and Revival. My favs over the past few years!